Audience Response Systems – What Are They? Gone are the days when you would need to collect a series of questionnaire sheets at the end of a conference or meeting. With Audience Response Systems the results are instantaneous. An Audience Response System is a handheld device very similar to the one seen in the 90’s television Game Show ‘Who Wants to be a Millionaire?’ The purpose of these systems is to collect data on an anonymous group of individuals, generally for opinionated polls. Previously, for meetings or large conferences of 50 or more participants, you would need to have printed off a set of questions or options and handed them out at the start of the conference only to collect them in at the end. An Audience Response System is designed to make this process far easier by relaying the anonymous questionnaire data directly to your hand or computer at the click of a button. There are a variety of styles of Audience Response System with their design varying slightly depending on the purpose of the system, although they still provide a crucial means of communication for large conferences where more than one person might not be heard at once. 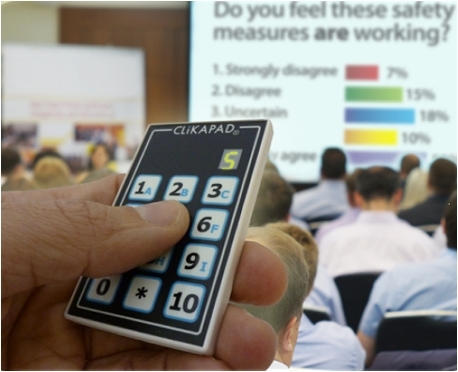 With a range of functions on the systems from built-in microphones to facilitate discussion to multiple choice question customisation to simple voting devices created to make a specific decision, an Audience Response System is incredibly useful for business and conference events. There will often be times when an individual has a particular opinion about a manager or a product but may be loathe to voice this opinion because it may lead to an unfavourable change in employment or even a termination of employment. For this reason questionnaires where the participants name is required or even where personal handwriting is required to complete the form may not always contain accurate information. People are hesitant to provide their true opinions unless given complete anonymity. This can be easily achieved with an Audience Response System as all the data is collected wirelessly and there is no need to provide personal information. The participants are free to express their opinions without fear of rebuke. Granted this can have some adverse effects in that some individuals may become too opinionated, but it is incredibly helpful for those who feel they have something meaningful to add to the discussion but do not want to reveal their own identity. Multiple choice Audience Response Systems are a great way to provide more than one options in the event that you wish to collate more specific data. For example during a meeting you could be discussing the launch of a new product and need ideas and inspiration as to the marketing direction you would like to take in regards to the product. By inputting these options into the Audience Response System you can see which has the most popular vote and you could even use it to create a prediction as to what the general public would prefer. Plus as all the information is anonymous and instantaneous all results collected should be 100% genuine opinion. You will be able to gather quick and efficient results on any question you pose to your audience. Long conference meetings can drag on particularly if it happens to be a yearly review or outlining some major changes occurring within the company, so it is important to take regular breaks in order to keep concentration and morale levels at a high. By integrating audience response systems to create quizzes interspersed with more serious topics throughout the conference, they provide a fun break from serious business talk and also keep the audience entertained. You could even incorporate these quizzes into the subject matter of your speech or conference which will help the audience to concentrate and will reiterate any points you wish to make when addressing the audience. Whether your planned meeting is long or short, large or personal, it is important to keep your audience entertained and involved with the discussion at hand in order to collect adequate data and get important feedback on how the company and the conference is doing in terms of successes and improvements needed. Depending on the type of conference you may be hosting you may need a certain style of Audience Response System. However with a variety of different options available plus with systems that are available for hire for training days, exhibitions and market research for the general public to interact with, an Audience Response System is a great addition to any growing business, providing instant, collectable data that is easily compiled and completely anonymous for your benefit. Mike James is always on the look-out for the latest technology designed to make previously simple and relatively mundane tasks more interesting and efficient. As a technology geek he writes about his finds for CLiKAPAD, leading suppliers of audience response systems.